Alex Thiel is a goldsmith, a designer and a woman with attitude. 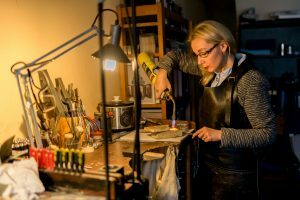 She began her creative journey in her native Poland and found her creative home in Ireland, originally, she was a wedding cake decorator making intricate designs in marzipan and cake toppers, the most curious being a request for 2 snails. When Alex moved to Ireland in 2008, she had very little English and knew only one person, she arrived in this strange culture and different land but felt at home, when she wasn’t struggling to find her natural path. Alex survived the challenges and found her feet and soul in jewellery. After working with a jeweller in Cork, who became her jewellery mentor she finally took the plunge and moved to Kilkenny to train as a goldsmith, in her interview for her College place at The Design and Crafts Council of Ireland, she sealed the deal with her edible flowers and metal interpretations of them. Alex graduated with a diploma in Arts from the National University of Ireland, Jewellery and Goldsmithing Skills and Jewellery Design Course. Following her college and apprenticeships, life and love drew her back to Cork, which has now become her home and business hub. Thiel has been shortlisted in two major jewellery competitions in 2017, Royal Dublin Society (RDS) Craft Awards and Irish Made Awards by Irish Country Magazine. All of the precious stones, pearls and metals used by Alex Thiel Designs are ethically sourced.